The next day was a move day from Tengboche to Pheriche which I was pretty sure I was going to sit out. I woke the next morning and felt a little better so decided to stick with the team and the schedule and move on up. 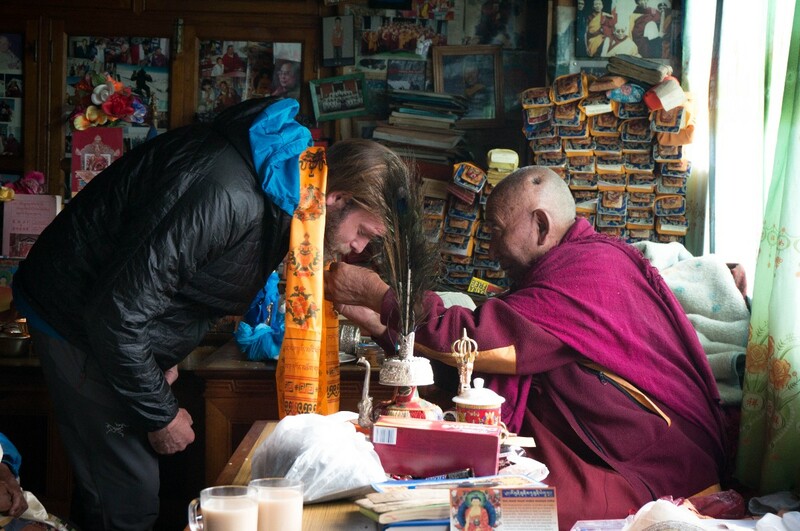 I dragged myself up to our first stop which was the house of Lama Geshe a Lama from Tibet. We participated in a ceremony where Lama Geshe blessed us for our journey ahead. Our next stop was a small town where we ate lunch which seemed to give me much needed energy. We then powered on for another two hours through worsening weather into the surprisingly built up town of Pheriche which had one of the nicer lodges we have stayed at in the past week. My antibiotics have worked and I am on the mend. The aches are gone and the coughing is less. The diarrhea is another issue but expected in this part of the world so overall I will consider this a small win. I sit here in the Himalayan Hotel in Pheriche finishing this post knowing that this will be the last roof over our heads for the next six weeks as tomorrow we move to Lobuche Base Camp where we will begin tent life. Apparently the internet is sketchy from here to Everest Base Camp so I may not be able to do any updates for a while. Summary: all is good but missing wifey and home.